Until now, customers wanting to use their iPads/iPhones as a chart plotter with wireless AIS data reception, were pretty much limited to the popular iNavX app. Now Transas the leading supplier of electronic charts and ECDIS software to the commercial market, have updated their iSailor app to support the display of real-time AIS data. Compatible with Digital Yacht’s iAIS wireless AIS receiver or any other AIS unit connected to one of our WLN10HS wireless NMEA servers, iSailor will display your boat, along with all of the surrounding AIS targets on detailed Transas electronic charts. Chart portfolios are available for any area of the world and the charts are the same high quality as those used on the Transas ECDIS systems on large commercial vessels. The iSailor App is free to download from the Apple App Store and then you purchase the chart portfolios that you need. Typical prices are around £17.50 (GBP) per folio, and to enable the AIS functionality, you need to do an “in-app” purchase and this costs £6.99 (GBP). So for less than £25 you get a very powerful Chart Plotter and AIS display. iSailor supports TCP (single secure connection) and UDP (multiple connections) so more than one iPad/iPhone can receive the AIS data if necessary. 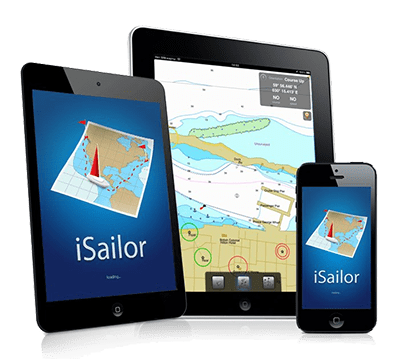 If connected to a Class B Transponder, iSailor will also take the Boat’s position from the VDO message which means that even non-3G iPads and the iPod Touchs that do not have their own internal GPS can still be used with iSailor. For more information on iSailor click here.